Israeli security officials say Iran planning to 'avenge' strike on base in Syria, looking to hit Israeli targets with missiles from Syria. The Tehran regime could be preparing for a major escalation with Israel in the near future, Israeli security officials fear, with possible missile strikes by Iran from sites inside Syria. Iran is likely to attempt a reprisal against Israeli targets, Israeli officials believe, following last month’s strike on the T-4 base in Syria, a facility believed to be used by Iranian forces stationed in the war-torn country. The base had been used by Iranian drone pilots to control a craft which penetrated Israeli airspace in February. According to a report by Channel 2 Sunday night, attempts by Iran’s Revolutionary Guard Corps to ‘avenge’ the April 9th strike on T-4 could include missile fire from Iranian-controlled facilities inside Syria to Israel’s north. While Israeli officials believe Iran could attempt a major attack on Israel, according to the report Sunday night, security experts nevertheless doubt Tehran would seek to provoke a full-scale conflict with the Jewish state. The presumption therefore at this time is that Iranian strikes would likely be confined to military targets, as opposed to civilian “soft” targets. The Revolutionary Guard is likely to rely at least in part on proxy forces – units from the Lebanon-based Hezbollah terror group and pro-Iranian Shi’ite militia groups in Syria – to take part in the missile attacks. 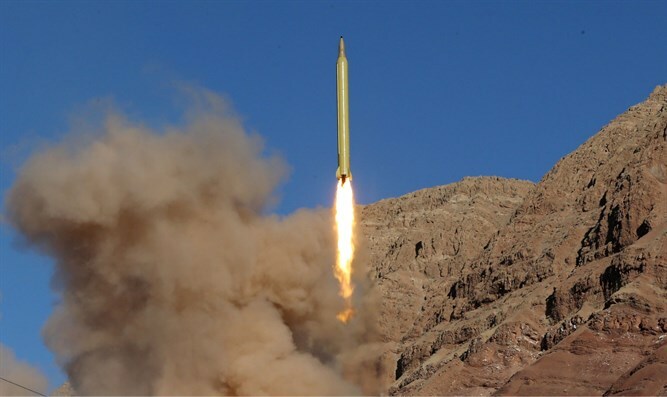 Iran, Israeli security officials say, is already taking steps to ensure plausible deniability in any possible missile launches by deploying Hezbollah terrorists and others to possible launch sites. Earlier on Sunday, Israeli Prime Minister Binyamin Netanyahu alluded to a possible confrontation with Iran in the near future, saying that while Israel preferred to avoid any military escalation, if a conflict was inevitable “it is better now than later”. “In recent months, the Iranian Revolutionary Guards organization has transferred to Syria advanced weaponry in order to attack us both on the battlefield and on the home front, including weaponized UAVs, ground-to-ground missiles and Iranian anti-aircraft batteries that would threaten air force jets,” Netanyahu said at a cabinet meeting Sunday.